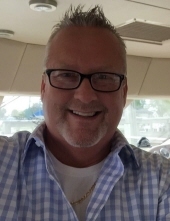 STOKES, Richard Dean "Rick" - Age 53, of Fenton, passed away Tuesday, November 27, 2018. A Celebration of His Life will be held 4 PM Sunday, December 2 at Sharp Funeral Homes, Fenton Chapel, 1000 Silver Lake Rd., Fenton. Pastor Jeff Hartman officiating. Visitation will be 12-4 PM on Sunday. Interment will be held at a later date in Highland Township Cemetery, Milford. Those desiring may make contributions to the Cystic Fibrosis Foundation. Rick was born March 10, 1965 in Redford, the son of James and Donna (Hawkins) Stokes. He lived in the Fenton area for the past 27 years, coming from Highland. Rick was a 1983 graduate of Lakeland High School. He was an independent Contractor and Builder. Rick was a member of the Algonac Harbor Club. He enjoyed boating, snowmobiling, and anything with a motor. Surviving are: 3 children, Andrew (Stephanie) Stokes of St. Clair Shores, Joshua Stokes of Ypsilanti, Amanda Stokes of Linden; 3 siblings, Peggy (Mike) Bostwick of Clarkston, James (Cynthia) Stokes of Milford, Dawn (John) McLellan of Fenton; several nieces and nephews; former wife, Tammy Gilbert-Stokes of Davison; and girlfriend, JoAnne Goulette of Fenton. To send flowers or a remembrance gift to the family of Richard Dean "Rick" Stokes, please visit our Tribute Store. "Email Address" would like to share the life celebration of Richard Dean "Rick" Stokes. Click on the "link" to go to share a favorite memory or leave a condolence message for the family.